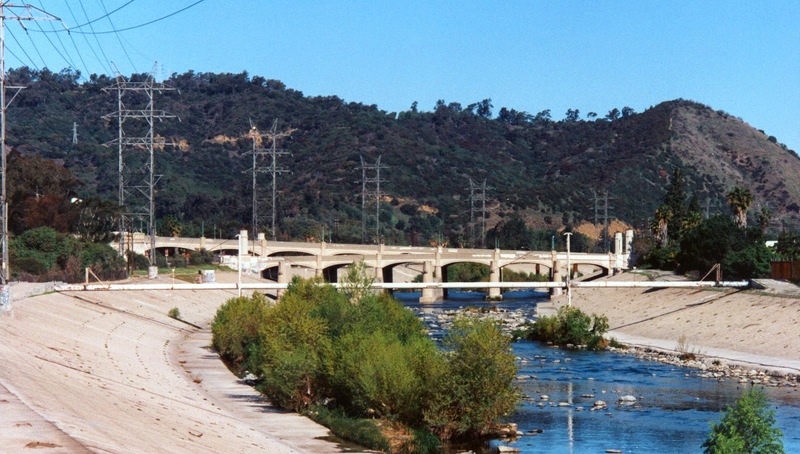 The view looking upstream at the Glendale and Hyperion Bridges. Like the previous Los Feliz Bridge, these bridges have extremely long cutwaters downstream but almost no cutwaters upstream. On all these bridges there's a concrete river bottom that becomes sand and rock downstream, so maybe the long cutwaters have something to do with controlling the river at the transition between smooth and rough? In the Google earth photo the Glendale and Hyperion Bridges location is identified with a red placemark. As shown in the photo above the bridges are at the southeastern edge of the Santa Monica Mountains. The colored lines indicate the earthquake faults, which have formed these mountains over millions of years. 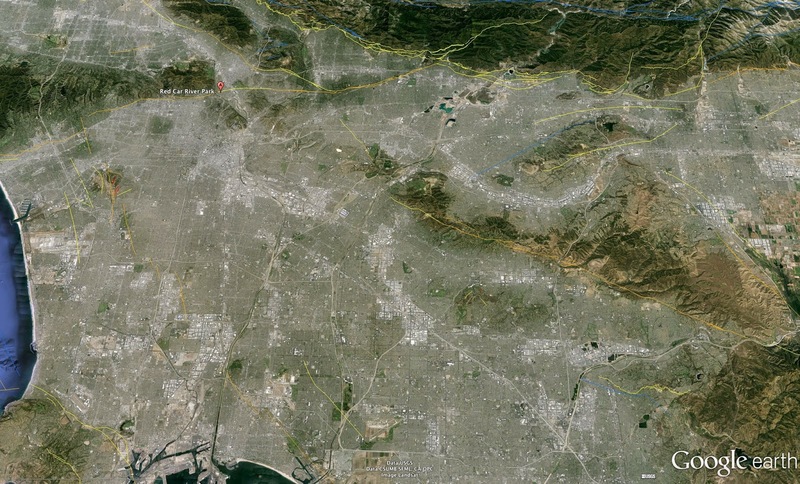 The mouth of the Los Angeles River can be seen at the bottom of the photo emptying into San Pedro Bay. Los Angeles County, California Bridges: Hyperion and Glendale Bridges across the Los Angeles River (2) by Mark Yashinsky is licensed under a Creative Commons Attribution-NonCommercial-NoDerivatives 4.0 International License.